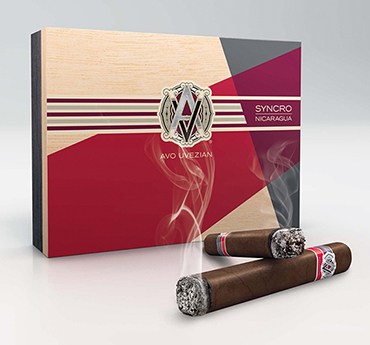 AVO Syncro Nicaragua is the first in AVO's Syncro Series of premium handcrafted cigars. The medium- to full-bodied, box-pressed Syncro Nicaragua is magnificent to behold and wonderfully smooth, balanced, rich, and complex. AVO's master blender captured the sweet and spicy flavors from rare and exceptional tobaccos grown in the rich, volcanic soil of Ometepe, Nicaragua, and perfectly synchronized them with the soft, creamy notes of the finest Dominican tobaccos from AVO's estate to produce Syncro Nicaragua cigars. The long filler is composed of Nicaraguan Ometepe leaf and Dominican Piloto Cubano, San Vicente, and Olor/Piloto tobaccos tucked inside a Dominican binder, and finished in a spectacular Ecuadoran Connecticut wrapper. You'll savor every note of this harmonious smoking experience the likes of which only AVO can create.